The Lotus Notes DXL Exporter tool is designed in such a way that it provides users an option to convert Lotus DXL file to PDF document. 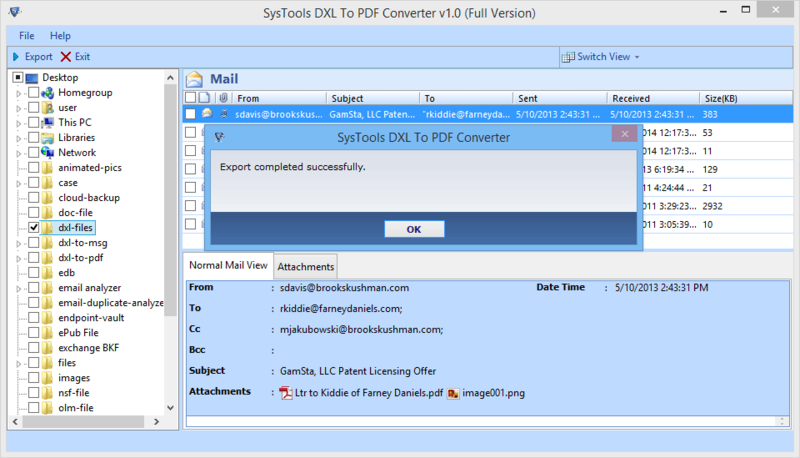 However, the tool will create a separate PDF file for each DXL file. All the associated attachments remain integrated within the tool and it preserves Meta properties of the software even after conversion. To open & load DXL files, one needs to locate the folder that contains DXL files. However, the tool has a Windows explorer style user interface, so it is not necessary to know the exact location of DXL emails. The tool is capable enough that it DXL files & load it automatically. After this, one can easily preview all the messages along with attachments and associated attributes. With the help of this DXL to PDF Converter software, one can also export selective DXL files also into PDF format. A user just need to check or uncheck the desired DXL files. The tool will generate PDF files for only that selected DXL file emails. 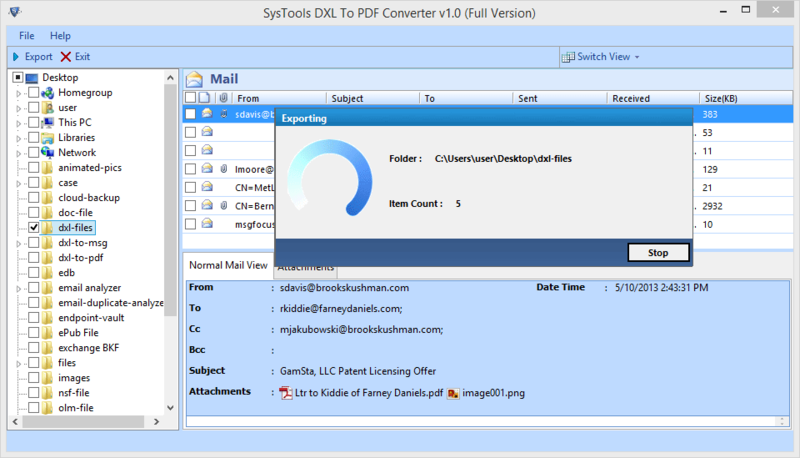 In addition, if a user wants can export complete folder also containing DXL files in it. However, the complete migration process will change the original formatting and meta properties of the emails like to, cc, subject, bcc, etc. 1. Maintain Hierarchy: Preserves the original folder hierarchy. 2. Flat Hierarchy: Save all Lotus DXL emails in a single folder. 3. Store at source location: Option to save resultant files at the same source file location. While saving Lotus DXL as PDF document, the tool provides users an option to save the resultant file using any desired naming convention. 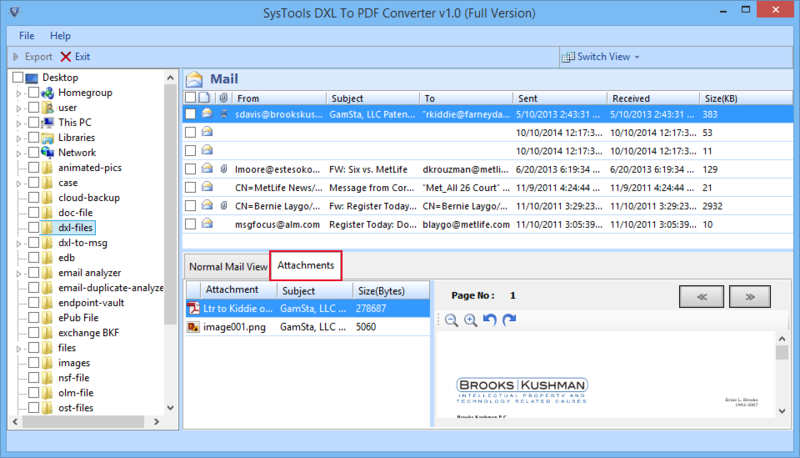 However, by default, the tool will save the PDF file using a Subject line of the email. If a user wants, then he can use a different convention such as Subject + Date (YYYY-MM-DD), Auto incremental, MD5 of email etc. 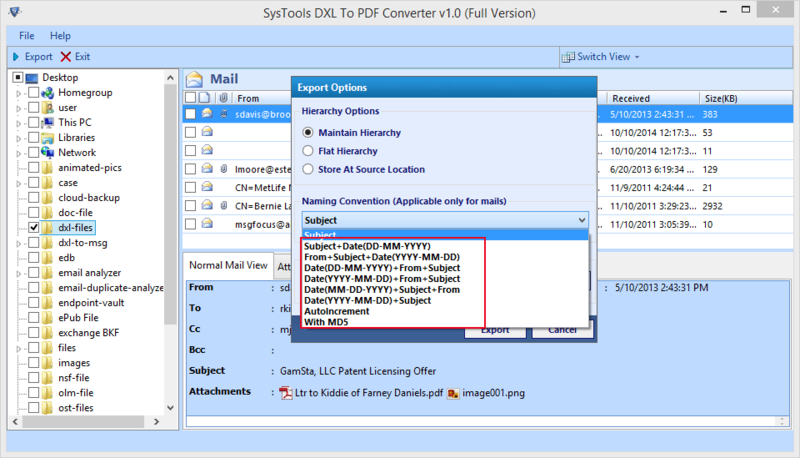 While using this Lotus Notes DXL to PDF Exporter, the another feature offered by this tool is switch display mode. However, one can either switch to vertical view mode or horizontal view mode using this software. By default, it uses the horizontal view mode of the screen, if a user wants, can change it accordingly. Is it necessary to have Lotus Notes Application installed on the machine to perform conversion? No, it is a standalone application, It does not require any extra installation to export DXL to PDF format. 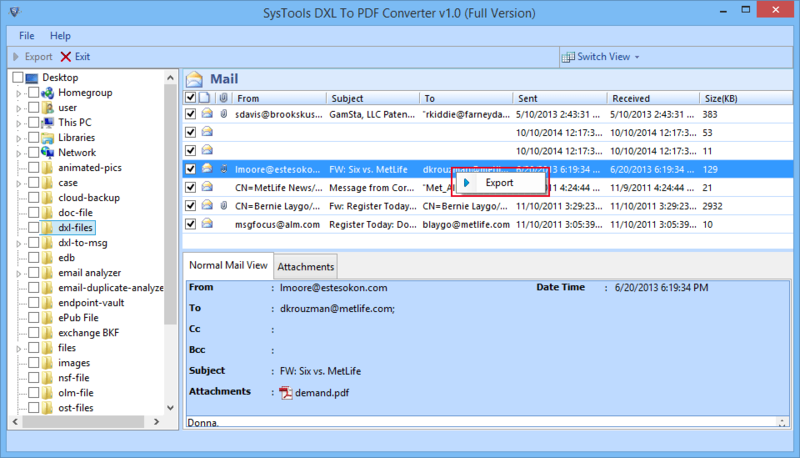 Can I export unlimited number of DXL files using this Lotus DXL to PDF Exporter? 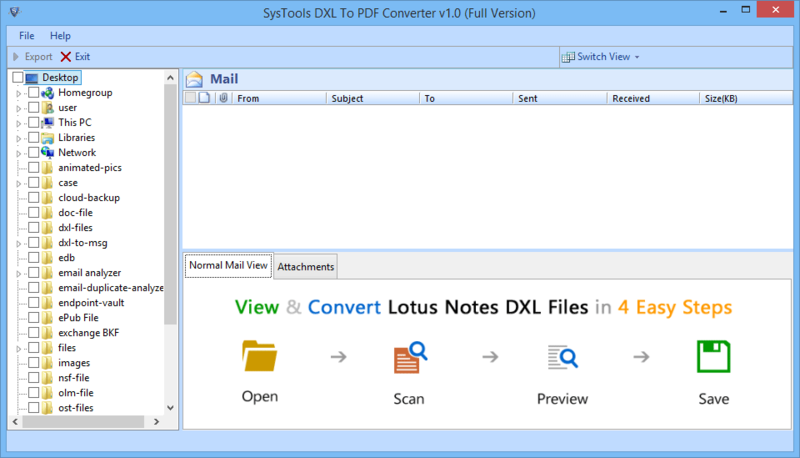 Yes, you can easily convert any number of Lotus DXL files to PDF format using this software. The application does not have any such limitation. Does the Domino Server File to PDF converter impose any file size limitation during the conversion process? No, the software does not has any file size limitation. 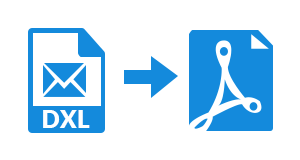 A user can export any size DXL file to PDF format without any hassle. Can I save resultant PDF files using any desired naming conventions? Yes, the software provides flexible naming conventions option to save the PDF file. A user can choose any of them to save the file and manage them accordingly. Does the software preserves the Meta Properties of the DXL file after exporting Lotus DXL to PDF format? Yes, the Lotus DXL Exporter maintains all the Meta properties and attachment associated with messages even after conversion process. A Windows Explorer view is displayed as it is convenient way of locating multiple folders. Then, choose the desired DXL file by choosing the parent folder. 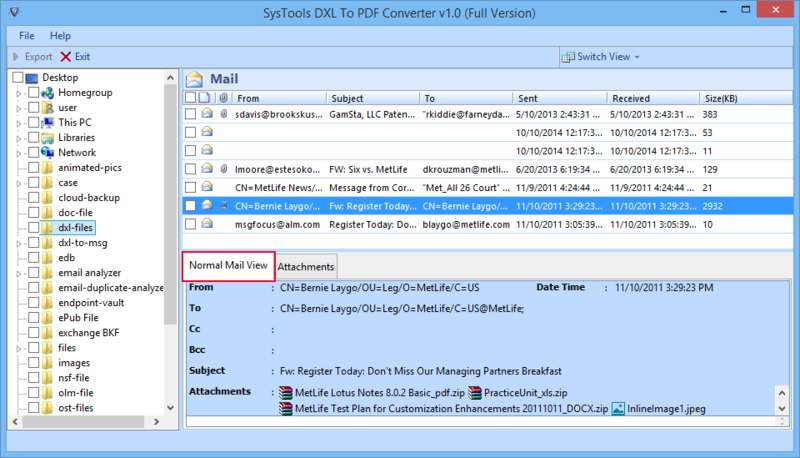 After selecting DXL file, you can easily preview the email messages along with its meta data in a Normal Mail View. To open attachments associated with emails, click on the Attachments Tab. Here, you can preview all type of attachments such as, .doc or .docx, .pdf, .xls or .xlsx etc. In order to export selective DXL files to PDF file format, choose the files by clicking on the provided check boxes. Here, you can easily select the desired file naming option. For example, save mail by Subject, From + Subject + Date (YYYY-DD-MM), Auto Increment, etc. 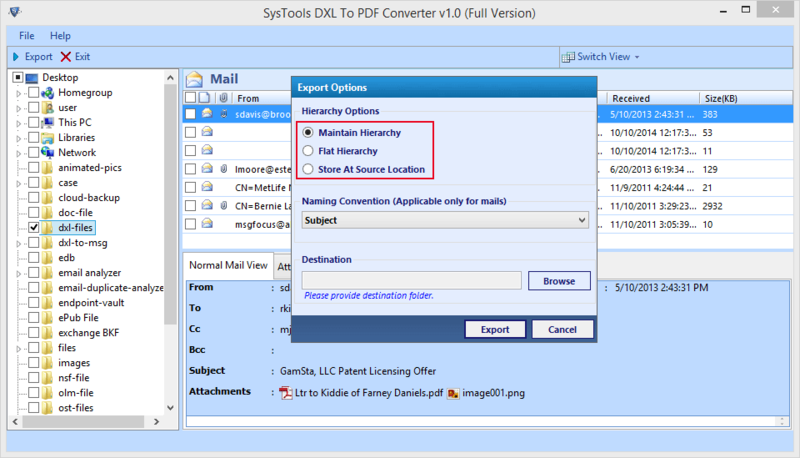 After selecting the desired destination location to save the output file, click on Export button and start the DXL File to PDF conversion. A screen with a live status report will appear. As the conversion starts, it will display a folder path, location of exported DXL file, and total item count. "I was searching for the utility that allows me to have permanent access to DXL file anywhere I want. 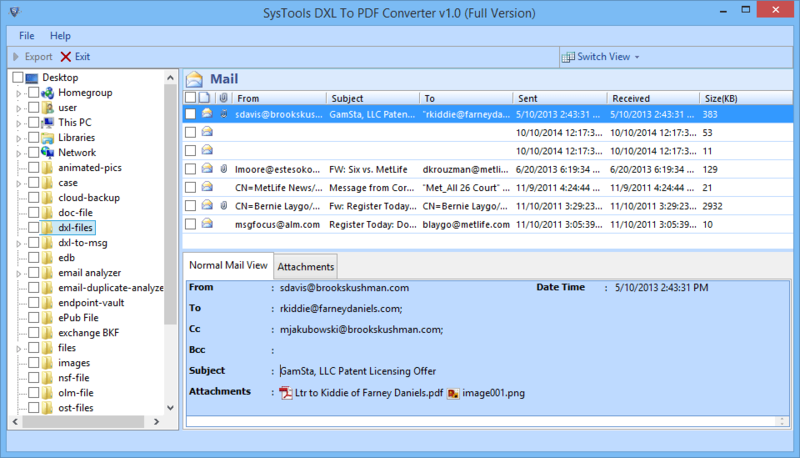 Thanks to this DXL to PDF converter software for helping me in the same. After exporting Lotus Notes DXL file to PDF format, it becomes really easy for me to access anywhere I want. Great work was done by the whole production team." "I was having lots of DXL file and from all of them, I want to export only 3 DXL File in PDF File format. Thanks to this amazing Lotus DXL converter software. It selective export option is really good and helps me in moving selective DXL file in just a few number of clicks. I am definitely going to suggest this tool to colleagues also."